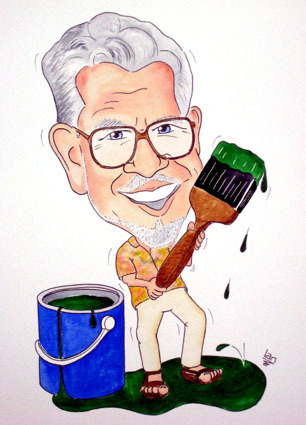 Rolf Harris has had a very varied career, musician, singer-songwriter, composer, painter, television personality and passionate advocate of sitting a mock exam. Okay I made that last one up but Rolf did make a very good point in an interview that I think illustrates one of the main benefits of sitting a mock exam. And the same applies to mock exams, you’re not sitting a mock to find out what mark you’re going to get, that’s just the by product, you’re doing it to make sure you will finish on time. Knowing all the answers is no good if you run out of time…. 1. Practice at leaving questions and moving on. Leaving a question you can do but have spent too much time on is easier said than done, remember there are often easier marks in the first 5 minutes of the next question than in the previous one. If you sit a mock exam you can practice leaving questions, sticking exactly to the time indicated by the marks in the question. 2. It’s an opportunity – I like to think of exams as opportunities to improve, they help identify what you need to improve to be better next time. This means the more mocks you sit the better you get! 3. Helps manage ignorance – There will certainly be questions in the exam that you won’t be able to do, where you don’t know the answer. Managing ignorance is a higher level skill, it is the ability to have a go, give it your best shot, even if you don’t know, just use your common sense. You may be very surprised at your mark. Only when you sit a mock will you really force yourself to have a go. 4. Gives you an indication of the topics that you are good at and the ones you aren’t. Sometimes you think you know something but when it comes to it, like in a mock you don’t. Don’t worry there will still be time after the mock to brush up on those “think you know areas” areas. 5. Can help you deal better with stress. If you sit a mock exam it can feel like the real thing, but it isn’t. So if you panic and lose time as a result it doesn’t matter. It gives you a chance to think how you would deal with that situation should it arise again. But the best part of sitting a mock exam is if the mock you sit turns out to be very similar to the real thing. What would your chances of passing be then! Mocks should always be written with an eye on what might come up. On the whole a mock exam is not meant to predict success or failure although many people think of it like this, only the real exam matters. So why not give it a go and sit a mock exam this time, what have you got to lose. And finally no mention would be complete of Rolf without a chance to watch Rolf sing Two little boys. Nothing to do with exams but a classic…. This entry was posted in Exam techniques, Exam tips, How to pass exams - tips, Importance of exams and tagged Education, Professional Exams, Test (assessment). Bookmark the permalink.